I’ve done a lot of desserts as of late, and that’s not exactly healthy. It’s tasty, sure, but not healthy. This week’s recipe will be one of our first entrees to make together, but it’s going to take all of us to catch the elusive and nigh ungankable Tahm Kench. 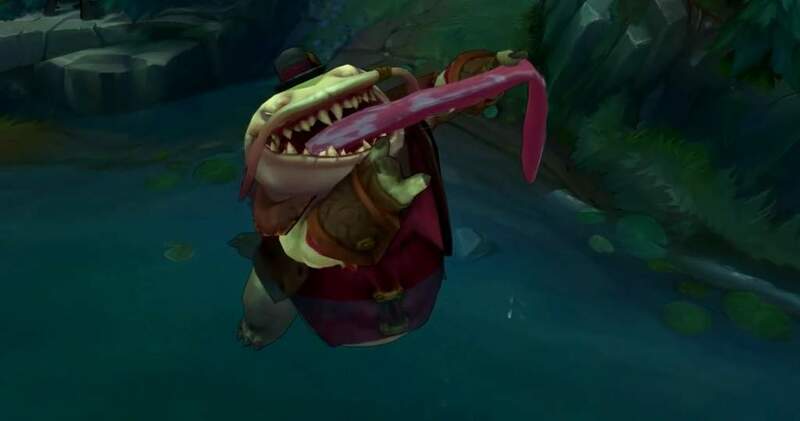 What makes Tahm Kench such a difficult catfish to catch? Might be something to do with the fact he’s a giant catfish or that he has southern charm. Truth be told Tahm Kench is my favorite champion to play on Summoners Rift right now (outshining my previous love of Jinx) for his fun play style, mobility, and references to food. The guy is always hungry and let’s you know it. The Tahm Kench cookbook was also posted on the League of Legends forums around the time of his release, and was a major inspiration for Smorgasdork! So I had to do something nasty to the 9 ft tall river king, and that thing was fry him up. Tahm Kench is a many layered character, and by that I mean that he has health. gray health, and a shield, so we’re going to replicate that in his preparation. In our recipe mushroom topping is the gray health while the shield and health are the bread crumb crust and catfish respectively. Starting with the topping, you can use a food processor or a knife & spoon to dice the pickles and mushroom while mixing in the spices. Set aside for later. Take this moment to add the spices (paprika, black pepper, cayenne, garlic, and cumen) and bread crumbs together, as well as setting the oven to 375˚F, because we’re going to be unbenching the Kench. For the catfish, it’s best to set up three large plates or bowls for the process of dredging your fillets. Easiest way to do this is to have plate one the egg wash, plate two the bread crumb mix, and plate three the rest station. Starting with the egg wash, dip both sides of the fillet in the egg, then bread crumbs, the set on the rest plate. Repeat for the second fillet. Place the breaded fillets into a cast iron skillet. Add the mushroom topping to each fillet and spread evenly. Now I mentioned earlier to have the oven on, which you should, but we’re going to take one additional step and place the skillet onto the stove top at high heat for about 10-15 minutes. We’re searing the bottom of the fillet, making it easier to take out and making a crisp crust. After the sear, toss the skillet into the oven, and cook for an additional 30 minutes or until the top browns. It should come out with a crisp crust and a moist inside. Serve with black beans and rice or sauteed mushrooms and onions, and enjoy, because you’ve just successfully served Tahm Kench.